The Days of Johann, an agility dog! 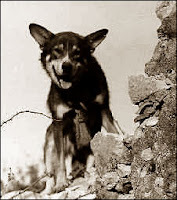 : This Veteran's Day we salute the dogs of war! This Veteran's Day we salute the dogs of war! Today is Veteran's Day. This special day we are saluting the dogs of war. Throughout history dogs have played a large part in the freedom of our nation. Chips is a great example. Spirited and quick to learn, Chips served bravely as a tank guard dog, traveling throughout Europe, Africa, and Italy with General Patton's Seventh Army. On one occasion, Chips alerted to an impending ambush. Then, with a phone cable attached to his collar, Chips ran back to base, dodging gunfire so that the endangered platoon could establish a communications line and ask for the backup they so desperately needed. To further salute the dogs of war, we put together a Squidoo lens in their honor. Visit the lens and learn more about these wonderful, brave canines. Thanks for reminding me that we should honor our four legged veterans too, today. I refreshed an article I posted about a heroic dog named Jeff from the Vietnam War. A big thank you to all of our veterans and another thank you to the people who remember them today.